These embellished tulle dresses are not only incredibly pretty but expertly crafted. 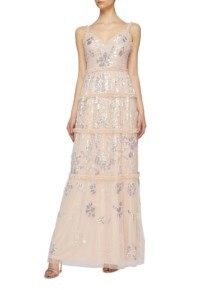 Take the Splendour white gown by Temperley London for example. This dress may be inspired by vintage motor racing but it certainly hasn’t restricted its more artful elements. Notably where black and white sequins and crystals mimic checkered racing flags and stars in truly glamorous fashion. 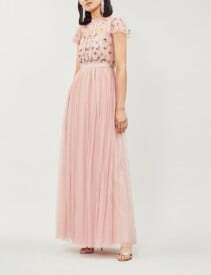 The puff sleeves and full A-line skirt combined with a defined waist result in a flattering and timeless silhouette. A considerably more dramatic look comes in the form of the embellished lace and tulle burgundy gown by Pamela Roland. 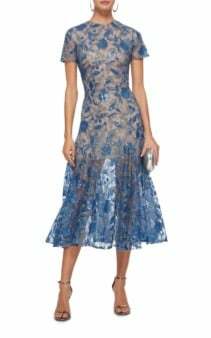 This off the shoulder masterpiece is undeniably eye-catching from the embellished bodice down to its theatrical puddle train. Ruching on the internal boned corset ensures a close, sculpting fit for the wearer. Meanwhile, the reflective sequins and beading contrast beautifully with the matte finish of the tulle overlay. Black accessories will serve to enhance the finer beaded details on this showstopping gown. There’s nothing like stepping out in a dress that showcases your figure and these tulle dresses will do just that. 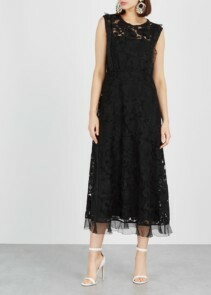 The black velvet tulle midi dress by Asos Design is one such dress is as versatile as it is beautiful. Owing to its all black design and classic cut this dress can be styled with a vast array of coloured, neutral or metallic accessories. The fitted bodice with a square neckline and V cut-out is eternally flattering. The voluminous skirt then provides the perfect contrast adding shape and character to your silhouette. Long sleeves and sumptuous velvet make this dress ideal for winter events. 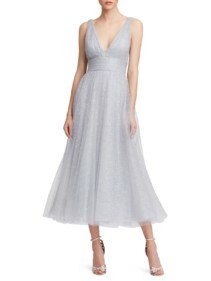 To add some sparkle to your look, opt for the silver tulle glitter gown by Marchesa Notte. 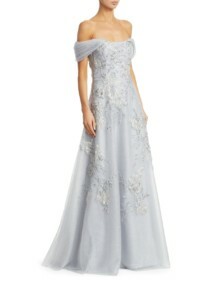 The defined, ruched waist and low V-neckline create a wonderfully elegant, feminine shape for the bodice. The full A-line skirt then adds volume to the dress which is finished with a simply magical glitter effect. Style this dress with metallic heels and watch your stunning ensemble sparkle in the light.